Facebook memes and photos were at the heart of astroturfing allegations against young members of the Quebec Liberal Party. It is what it is—unless it’s something else as well. That’s the message some students are sending to the youth wing of the Quebec Liberal Party, after two members were accused of engaging in political astroturfing. Astroturfing, named after the term for the synthetic grass used in sports arenas, refers to the creation of seemingly grass-roots organizations that are in reality backed by a powerful entity. In this case, two representatives of pro-tuition hike group Mouvement des étudiants socialement responsables du Québec were outed as members of the Quebec Liberal Party in a post on the Facebook page UQAM Memes. 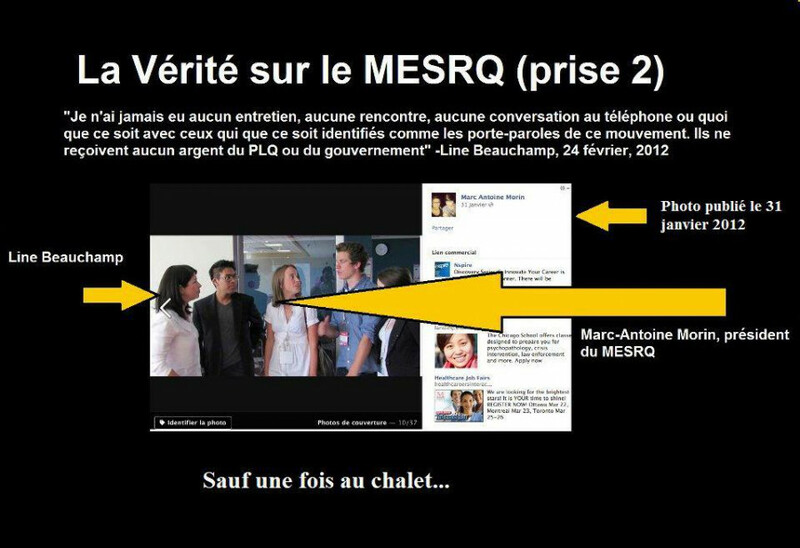 In the image macro, pictures of two students, Jean-Francois Trudelle and Marc-Antoine Morin appearing on a show on French television station TVA as representatives of MESRQ are contrasted with pictures and Facebook screen captures identifying them as members of the Youth Commission of the Quebec Liberal Party. “It’s very strange that those spokespeople revealed their links with the QLP [only after it came to light],” said Gabriel Nadeau-Dubois, a spokesperson for student lobby group Association pour une solidarité syndicale étudiante. However, QLP Youth Commission President Maripier Isabelle dismissed the charges, saying that Trudelle and Morin, though involved with the QLP, were acting on their own, and not as representatives of the party. “It’s kind of a non-issue,” she said. “Some members of some students’ associations heard that Marc-Antoine and Jean-Francois were members of the QLP and that they were also involved with the MESRQ. Isabelle added that the Youth Commission and MESRQ had different positions on the specifics of a tuition hike, though both groups support the general idea. She also noted that both Trudelle and Morin were involved in a regional forum of the Youth Commission as organizers, and were not among the organization’s higher ranks or spokespeople. Nadeau-Dubois mentioned that while he wouldn’t accuse Trudelle and Morin of working at the behest of the QLP, he did find it odd that Education Minister Line Beauchamp would deny ever having met Morin, despite a photo that surfaced of the two together. Isabelle claimed that while the two may have met, the circumstances of when the photo was taken were such that Beauchamp likely would not remember the encounter. The incident occurred during a heated week in which pro-tuition students gained the spotlight. In a Feb. 23 article of La Presse, MESRQ member Arielle Grenier claimed that she had been the victim of threats and intimidation. Nadeau-Dubois, who debated Grenier on the Radio-Canada television show Tout le monde en parle on Feb. 26, said that this kind of behavior just goes to show how hot a topic tuition currently is.